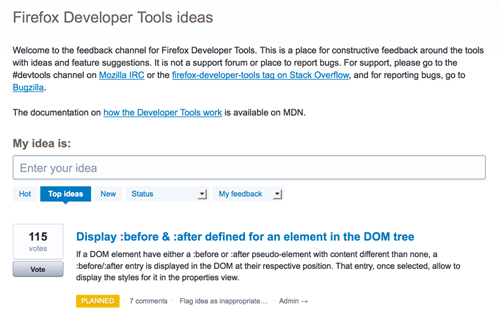 Last week we launched Feedback channels, with the first one out on Developer Tools in Firefox. The feedback channel on UserVoice is the place to go for any ideas or thoughts about the Firefox Developer Tools. Notable is that many ideas that came up are things that we already have bugs for in Bugzilla and ideas and approaches that have been talked about and considered. So, sincerely, thank you for all the input and constructive ideas and comments! We appreciate it a lot and by having this direct dialog and communication with you, it helps us to build better and more useful Developer Tools! Please continue to express your ideas, vote on existing ones and stay on track with the progress!